If you'd like to directly specify dependencies in scripts using #! see the “Shebang Deps” section of Dependencies. Alternatively, you can make use of cljs.core/*main-cli-fn*. If this Var is set to a function, and -m hasn't been specified, then the main function will be called. All that needs to be ensured is that the code that set!s *main-cli-fn* is called, either via a -e to require the needed namespace, or by direct execution as in the example above. When writing scripts, getting input from standard input is quite useful. Clojure has two dynamic vars, core/*in* and core/*out*. Whenever you use println, you're actually printing to whatever core/*out* is bound to. 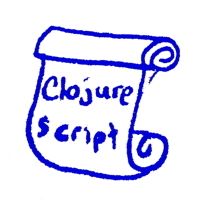 ClojureScript has its own *out* which lives in cljs.core, but it lacks (for obvious reaons) *in*. Planck, though provides planck.core/*in* which lets you interact with standard input. If you'd like to gain access to the command line arguments passed to your script, they are available in cljs.core/*command-line-args*. [["-p" "--port PORT" "Port number"
If you run a script that starts a timer, or launches an asynchronous shell interaction, the script will continue running so long as there are pending timers or shell activities.